I am not much of a beauty junkie, but I do like to read up on the latest/interesting products and there are some beauty products out there that has piqued my interest. One of them is this! The BrowHaus Eyelash/Eyebrow Extension Serum. Supposedly it works like a mascara, you just have to apply it on your lash line every night. After continuous use, you'll wake up to longer, lusher lashes! Sounds magical I know, but I like it that you can also brush it in the sparser areas of your eyebrows so you only get hair growth where you want it. Everything about the reviews sounds promising, except the price. While I'm not too much of a beauty junkie, I do enjoy my scents. What I'm using now are all 5ml sample scents which I got for free lolol. They take forever to use up anyway so it doesn't really matter. 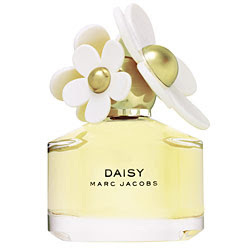 What I like about this Marc Jacobs Daisy perfume is the really light and refreshing scent. There are too many perfumes in the market nowadays and most celebrity launches such as Taylor Swift's and Britney Spear's are far too sweet for my liking. This is just nice, feels like Spring has arrived. This is definitely a blusher that I am interested to try out! My powder blushes simply melt off my face by midday, and it's such a hassle to reapply. I don't even bother to bring makeup out after I've applied, the only thing in my bag is my Nivea Pink Guava Lip Balm which I even forgot to use most of the time. Reviews about this tint blusher seems to be 80% positive, and I do like the color. It looks like a very natural healthy flush and it's build-able. A little bit pricy but I don't think you can trust me with money, because I am a Watsons makeup girl. I buy all my makeup from Watsons and I wait til their sales to do so too. Sometimes when in doubt, I just buy whatever's on promotion. Lol so maybe this blusher is little bit higher up the rung since I saw it at Sephora. Okay will faster finish my ZA then try this out. Unless Santa decides to gift me because I still believe in Santa. HAHA! Decleor Post-Wax Double Action Gel! Yes yes yes, I want to try this product! Supposedly it helps to sooth skin after epilation and it doubles as a gel to slow down hair growth too. Sounds very promising and the reviews were pretty positive too. Except, I have no idea where to get this. Is it available in stores in Singapore?